Since I looked all over this site for a Hampton Roads forum and couldn't find one I've decide to start one here. There is a lot of major developments going on in this area and it is really overlooked. Bear with me though, cause it's a lot to post. Town Center in Virginia Beach. BILL TIERNAN/THE VIRGINIAN-PILOT. Cool stuff. We don't have enough Hampton Roads traffic to warrant it's own subforum (yet). Feel free to post any information on the area right here, this is where it should go. These pics courtesy of guynvb of skyscraper page. On the corner of Main and Central Park Avenue is The California Pizza kitchen. This building will feature an open plaza where people can hang out, a place for the people. Ruth Chris's, Bravo, Ann Taylor Loft and The Funny Bone Comedy club will be located inside this building. Courtesy of Spark317 from ssp. Recap of Norfolk projects. These are in Norfolk only - does not include projects in the other cities of Hampton Roads. 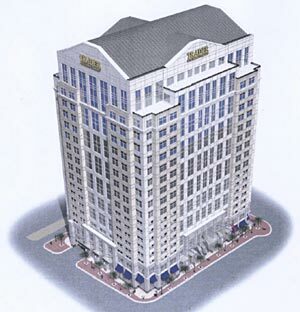 C: Granby Towers - one 25-story and one 15-story buildings with 400 total condos selling from $250,000 to $400,000. Includes parking and 17,000-square-feet of retail. Construction to begin Fall 2005 with the 25-story tower completed by summer 2007. F: The Tazewell Lots - 12-story building with first-floor offices, an urban market, and 77 condos selling from $160,000 to $450,000. Multi-million dollar housing, commercial, and retail project. Harbor's Edge project (see below) is part of the project. Revitalization of African-American centric community adjacent to downtown Norfolk. Multi-million and multi-year project. Includes renovation and re-opening of the Crispus Attucks Cultural Center (theater) in October 2004. The nation's first maglev train in development at Old Dominion University. Infrastructure (tracks, stations, and cars) in constructed and in place. $75 million housing and retail center at Old Dominion University. Completed rendering facing south down Central Park Ave. Walking up from the south end then up Town Center Drive you can see the construction on the new apartment building, The Cosmopolitan. The 14 storey building will feature 341 apartments with finishes and amenities not found in the area. Galyans is in the background. wow that is a lot of projects. the area should look extremely nice when they are completed. look at all the surface lots of the aerial of norfolk. it reminds me of the pic of jax in the 70s. Wow, very comprehensive, thanks for all the info, I like what I see. Go VA! The property at 109 E. Main Street, built in the late 1800s, was the first multi-level office structure in downtown Norfolk, according to Harbor Group. NORFOLK If you had breakfast or lunch recently with Peter Decker Jr., two things were likely to happen. You would eat at his sons restaurant, Egg Diner. And on the way there or back, Decker would take you inside the bank building at 109 E. Main St. to admire its architecture. I ve always been a fan of Italian Renaissance, and this is a classic Italian Renaissance building, he said. Decker will soon be able to gush at the structures beauty while working at his law practice. 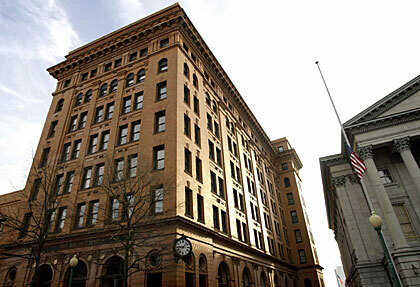 He and his wife, Bess, have a contract for the right to buy the century-old building from Harbor Group International. The deal is expected to close at the end of this month. The $5.7 million deal will be the latest in a string of transactions that clear the way for a new hotel and conference center downtown. That development, in the works for months, is expected to be announced soon. Harbor Group agreed to buy the building from BB&T last year when the bank signed a lease to become the anchor tenant at 500 E. Main. The firm has since sought to pass that potential ownership on to another buyer. The building does not fit into Harbor Groups portfolio of holdings, officials said. It is an excellent building, but it is not something we typically would focus on, said Jordan Sloan, chairman and CEO of Harbor Group. The company owns several large office buildings throughout the country, including 500 E. Main and Dominion Tower in Norfolk. While Harbor Group was looking for a buyer for the BB&T building at 109 E. Main, Decker was searching for a new headquarters for his law practice, Decker, Cardon, Thomas, Weintraub and Neskis, PC. The city of Norfolk paid $2.6 million for the building that houses Deckers firm at 201 E. Plume St. last summer . The acquisition makes way for the construction of a luxury Hilton Hotel, a conference center and an 800-space parking garage. Billionaire Robert Johnson, owner of the Charlotte Bobcats NBA franchise, will develop the hotel. Deckers law practice will occupy the second and third floors of 109 E. Main. At least one more tenant, likely a financial institution, is expected to occupy the building. The property, built in the late 1800s, was the first multi-level office structure in downtown Norfolk, according to Harbor Group. Bess and I are very excited to own a truly great part of our citys history,Decker said. It is a building that I have admired. Towncenter hotel condominium tower has been redesigned and increased to 35 stories in height. Below is a link to the developers briefing to city council last week (real player streaming video). They show a rendering of the new builing (which btw looks much better IMO) and the developer says explicitly that the trend is for things to get bigger (meaning this may not be the final height). Video is approx. 9 minutes long. When u get to the page click the pull down menu above the view council index button. Scroll down to "Resolution re Phase III Towncenter" Once you have that selected click on "View council index" and the 9 minute briefing will play. All the new proposals are great. But if the transportation concerns aren't addressed in the immediate future (i.e. 3rd crossing) the area is going to choke on its own success. I hope Norfolk also builds the arena that they are discussing in the city meetings. I wonder what else they are building. I heard they are tearing down the greyhound station to build something. Hey vdog where are you getting your info at? Various news sources and a few developers i know (who clue me into websites or online information whenever possible), and good old google. Below are some highlights for those who don't want to go to the site. On page three they talk of plans for no less than 4 mixed use buildings to include offices, apartments and a hotel, one of which will be atop a parking garage. Page 11 contains an overhead view of the zones. pages 14-17 are arial (sp?) views on the region being considered. Pages 18-20 show renderings of the residential buildings only (sorry, no mixed use tower renderings yet). I am currently in the process of getting links to plans for the HQ property so stand by. It's really starting to look like the "whole" pembroke area is going to be transformed into one very large downtown. I appreciate the info, let me know what else you find out about downtown norfolk, and especially about the possibility of a arena next to harbor park. Is it true Norfok is planning on building a 40 story high rise? So far just rumors, but well established rumors. All quarters seem to be hinting at this possibility but i have yet to find definitive proof or hear exactly who would be developing such a structure. The only thing that seems to be agreed upon is that if it is developed, it will go on the parking lot across from MacArthur center where they currently park all the police vehicles. That would be great for the skyline, I think they should clear out downtown plaza and start building there. What city do you live vdogg?